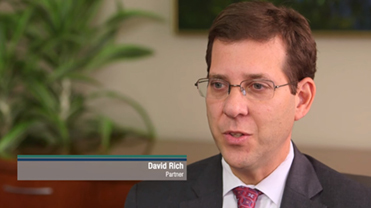 David H. Rich is a partner in the firm. While his practice is varied, he spends the majority of his practice focused on complex business and commercial litigation, first amendment law, and employment law. Mr. Rich is quoted frequently in the media and regularly lectures on matters relating to defamation law, employment matters and trial practice. Mr. Rich has provided defense counsel in a lender liability lawsuit, in a suit on a promissory note and guarantee, and in a class action against a regional automobile dealership alleging RICO violations. He has represented an insurance brokerage firm on a wide variety of employment-related matters, prosecuted a federal trademark infringement case against a major national bank, prosecuted a defamation lawsuit against an internationally known rock musician and major publishing company, and represented a national music retailer suing over a proposed lease extension. In 2015, Mr. Rich obtained a $6.05 million judgment for a prominent neurosurgeon involved in contract dispute with a major regional hospital over the failed development of a Brain & Spine Institute. The matter was tried over three weeks in the Massachusetts Superior Court's Business Litigation Session. In a 78-page decision, the Court ruled in favor of Mr. Rich's client and awarded $3.6 million in compensatory damages, in addition to attorneys' fees, costs and prejudgment interest. The Court concluded that the hospital and its corporate parent repeatedly breached the parties' agreements, and that the hospital's chief executive had "either failed to use best efforts to Comply with the Agreements or actively undermined the Institute concept from (almost) its inception." In its decision approving Mr. Rich's application for an award of attorneys' fees, the Court indicated that his rate and services were "eminently reasonable and ... appropriate for a business litigation matter of this factual complexity." In 2016, Mr. Rich obtained a $3.5 million defamation award from a federal jury on behalf of Saudi Arabian scientist Hayat Sindi, who sued Samia El-Mouslimany and her mother arising from numerous publications accusing Dr. Sindi of fabricating and exaggerating her academic credentials. He also persuaded the judge presiding over the trial to issue an injunction permanently barring the defendants from repeating defamatory statements about his client in the future. In 2015, Mr. Rich obtained a $2.9 million verdict for a former chairman of the Chelmsford Board of Selectmen in a defamation action tried to a jury in the Lowell Division of Middlesex Superior Court. The jury's verdict following the three-week trial included a finding that Mr. Rich's client had succeeded in proving, by clear and convincing evidence, that the defamatory statements that were the subject matter of the suit had been published with actual malice. At the time of the verdict, the damages award was the single largest jury verdict in Massachusetts in 2015. In 2014, Mr. Rich successfully represented the director of a non-profit youth organization in a defamation action against the Boston Herald and its reporter. After a multi-week trial, a Suffolk Superior Court jury returned a verdict in favor of Mr. Rich's client and awarded substantial monetary damages, including $550,000 in emotional distress damages. The jury found that Mr. Rich's client had succeeded in demonstrating, through clear and convincing evidence, that the Boston Herald's reporting had been published with actual malice. In a case tried in 2014 but decided in early 2015, Mr. Rich obtained a $2.525 million ruling, plus $700,000 in prejudgment interest, for an investment banking firm that had assisted in the sale of Planet Fitness to a private equity firm for $525 million. After a bench trial held in the U. S. District Court for the District of Massachusetts, the Court found that although the written contract between Mr. Rich's client and Planet Fitness did not provide a basis for an investment banking fee, damages were appropriate under a quantum meruit and unjust enrichment equitable theory of recovery. In November 2013, Mr. Rich persuaded the 1st U.S. Circuit Court of Appeals to reverse a decision of a lower court against his client, a guarantor who had been found liable by the trial court under an Environmental Indemnity Agreement. In reversing the decision of the trial judge, the 1st U.S. Circuit Court of Appeals unanimously held that the judge's interpretation of the Environmental Indemnity Agreement was "too broad," that the cost of the testing "fell outside of the scope of the Indemnity Agreement," and that the significant costs incurred by the lender were not "required to take necessary precautions to protect against the release of any Hazardous Materials." In a case of first impression in Massachusetts, Mr. Rich obtained a ruling from the Massachusetts Superior Court in 2013 that a Massachusetts court could exercise personal jurisdiction where "[t]he acts in question were purposefully directed to Massachusetts referenced individual resident[s] in Massachusetts and their company that is based in Massachusetts, and purported to be posted by a former employee with knowledge of the plaintiffs' business practices. The [internet] postings were plainly intended to cause harm in Massachusetts." Mr. Rich obtained a $20+ million-dollar verdict on behalf of a private equity firm. The legal action was commenced after an affiliate of Mr. Rich's client made a series of high-risk loans to a developer, Meadow Creek, LLC, for a real estate development project involving the construction of an 18-hole golf course and a 178-lot residential subdivision in Dracut, Mass. The developer failed to pay the loans when due and later commenced a "lender liability," usury and fraud-based lawsuit. After a nine-day jury-waived trial, a Massachusetts Business Litigation Session judge issued a verdict in favor of Mr. Rich's client and against Meadow Creek, LLC and its principal for $20+ million in compensatory damages, plus attorneys' fees.